Mount Shinmoedake, a volcano in Japan’s Kagoshima Prefecture, has been shooting smoke and volcano ash into the air in eruptions that could go on for months. One snapshot of the billowing smoke is reminding folks, myself included, of a cat. Eruptions have not reached the point of evacuation. Time reports that authorities are warning people to stay away from the volcano. The below image was snapped by Twitter user Yuhei. It has been retweeted over 36,000 times. 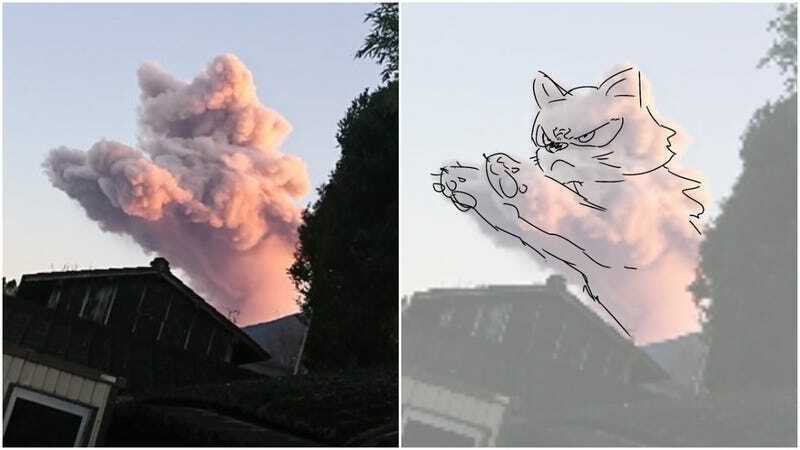 It really looks like a cat flying in the air. The volcano doubled a secret lair in the 1967 James Bond film You Only Live Twice and was featured in the film. Hopefully, everyone in the surrounding areas stays safe.